EDGE GLOBAL CONCEPT, is to start on the note of social responsibility – through social institutions. This year, our theme is ‘developing the nation through social responsibility, using 5 core social institutions’. The institutions we will be considering include: Government; Economy; Education; Marriage; and Religion. To this, our speakers are fully prepared to deliver highly motivated notes that will spur participants into being ‘socially responsible’ and having ‘concern to reduce social vices’ which are both the summations of the vision behind LEC. In Nigeria of today, government and private sectors’ efforts alone are not enough for social stability (in the country). Efforts of the citizenry, especially youths, are also required – hence, the establishment of Leadership Ethics Conference, LEC, and the theme under consideration this year. For the purpose of achieving our objectives/aims, we will be giving Certificate of Recommendation to 20 outstanding participants – this year. To create the interest to always work towards the peace and unity of the country and the vicinity of participants – in the participants. To create the sense of social responsibility in the participants. To motivate participants on reducing social vices. To inculcate human communication (relationship) in the participants. To create the spirit of self-sacrifice (for the purpose of changing the society for good) in the participants. To enlighten participants on the power of integrity. Before a participant qualifies for the certificate, s/he will have to contest for an entry in which only the 1st-given number candidates to send in answers for the questions asked will pass to the next stage. The 2nd stage and the 3rd stage until the 1st 20 positions are picked – will be written test based on the conference presentations, current edition of our online magazinenpublication, current affairs and the book, (Leadership Ethics), published on the conference. 1. To motivate participants on educational pursuit with the aim that after graduation, they have tangible document (certificate) to attach to their CVs. 2. To encourage beneficiaries to live a life of integrity and accountability, knowing that any misrepresentation of the sponsor and OE Global Concept amounts to withdrawal of the certificate, permanently. 3. To support those who may be looking for jobs but need standard referee for their cover letters. 4. To project the image of our sponsor before the general public as supporting moral values. 5. To work with our sponsor without any charges in getting qualified candidates for available positions among the receivers of the Certificates of Recommendation. Theme: Developing the nation through Social Responsibility, using 5 core Social Institutions. 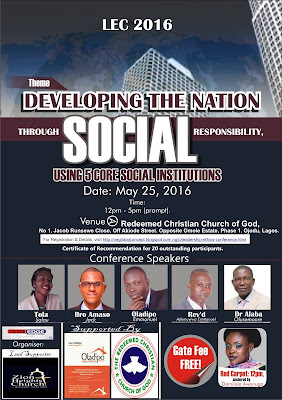 Venue: Redeemed Christian Church of God. No 1, Jacob Runsewe Close. Off Akiode Street, Opposite Omole Estate, Phase 1. Ojodu, Lagos, Nigeria. Red Carpet: 12pm-1pm, anchored by Damilola Awonuga. Amaso Jack, Oladipo Emmanuel, Rev. Ademuyiwa Emmanuel, Dr. Alaba Olusemoore, and TolaSalau. Please, note that registration closes on May 23, 2015 – at 11:59am. To register, click here.